What is Snow Travel Help? 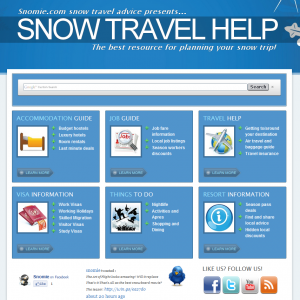 SnowTravelHelp.com was launched with the goal of making snow travel easy. We don’t think planning a snow trip should be a time consuming process involving hours of online research and gathering vague information from dozens of different websites. We want you to be able to find everything you need through Snow Travel Help without the headache usually associated with planning snow trips. All the searching has been done for you! We gathered all the information needed for a snow trip and put it on one easy to use website. What sort of information can I find using Snow Travel Help? Snow travel shouldn’t be a headache, so we made it easy! Visit Snowtravelhelp.com and let us know what you think!